Welcome to the Town of Eston! New to town? Check out our Eston & District Brochure, and don’t forget to contact our friendly Welcome Wagon representative. 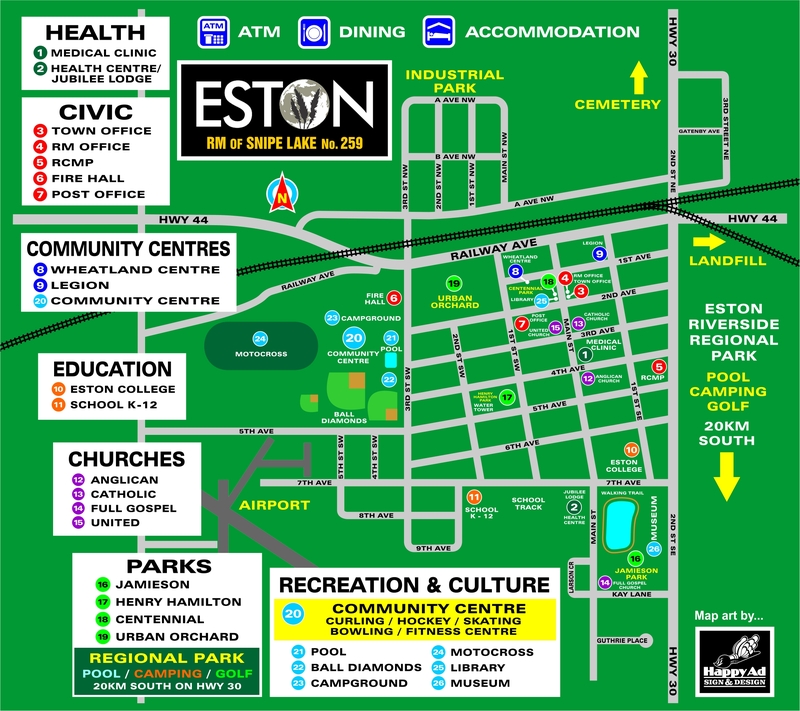 The Town of Eston is located in the heart of West Central Saskatchewan at the junction of Highways 44 and 30. The Town boasts a busy business district with services including a pharmacy, a grocery store with liquor vendor, two motels, restaurants, gift shops, a service station, card locks, a car wash, banks, a lumber yard and a hardware store. Tradespeople such as plumbers, electricians, building contractors and welders are resident in the Town. There are also a number of businesses serving the local agricultural industry. Eston has its own weekly newspaper, The Press Review. The Saskatoon StarPhoenix is available on a daily basis. The Town has a resident physician, a nurse practitioner, a clinic, a health centre, long term care facilities, emergency response services, a fire department and a RCMP detachment. A large multi-use community recreation and convention centre provides year-round recreational opportunities including hockey, bowling, curling and figure skating. The Eston Lions Swimming Pool is open during the summer season. Eston has two dance schools, as well as aerobics and other exercises classes. The Wheatland Plus 50 Club provides a variety of activities. Eston boasts three municipal heritage buildings, one on the Main Street and two at the local museum, the Prairie West Historical Centre. Besides preserving artifacts illustrating the area’s past, the centre is building up a collection of archival material pertaining to the area. There is an in-town campground adjacent to the AGT Community Centre. Two other parks provide green space. The Town has two schools, a K-12 school and the Eston College, a degree-granting institution. There are four churches in town: Eston Full Gospel Church, Holy Cross Anglican Church, Sacred Heart Roman Catholic Church, and St Andrews United Church. Eston has an airport on the outskirts of Town with two paved runways; #11 is .92 km long while #16 is 0.60 km long. Eston is located within the boundaries of the Rural Municipality of Snipe Lake No. 259, an oil-rich area which also boasts prime agricultural land and many opportunities for hunting and fishing. The Town is approximately 20 km north of the South Saskatchewan River and the Eston Riverside Regional Park, a prairie oasis boasting excellent camping, a nine-hole golf course with grass greens, a swimming pool and a recreation hall. The Lancer Ferry which crosses the South Saskatchewan River is nearby. Annual events in Eston include Ladies Night Out in April; the June Eston indoor Rodeo; July 1st Canada Day events including a parade, fire works and heritage programming at the museum; fowl suppers in season; Bizarre Bazaar, a large craft show and sale in November; Christmas in November, a ladies luncheon, fashion show and silent auction; a Christmas light tour in December; bonspiels, hockey and curling tournaments and skating carnival in season as well as a host of other special events throughout the year. Are you new to the Eston area or know someone who is? Our friendly welcome wagon volunteer would love to meet you and share a welcome package from local businesses!